I love fried chicken, but I’ve never been a fan of chicken breast. Dark meat just has so much more flavor and is more moist. I felt vindicated when a judge on The Big Family Cooking Showdown (Netflix) made a similar comment. Kotlety z Piersi Kurczaka (Chicken Cutlet) might change all of that for me. I used the same technique that I would to make Kotlet Schabowy. Pounding the chicken breast thin with a meat mallet (affiliate link), tenderizes the meat and insures that it cooks quickly and stays moist. (You won’t want to use the tenderloin or chicken tenders. It’s just too delicate to tenderize in this way.) With a delicious crisp crust, and a thin, moist bit of chicken breast Kotlety z Piersi Kurczaka (Chicken Cutlet) makes for a delicious meal. We prepared this recently for a Sunday Dinner with my parents and my sister, and it was a hit! We love chicken cutlets, although – like you -we prefer the dark meat. We also recently found the small chicken breasts at AJs – so flavorful and tender! Hi Barbara, I’ll keep my eyes open for the dish you’re describing. Maybe someone else will give us the answer too. my butcher carries boneless chicken thighs. they will work well with this. some grocery stores also carry boneless thighs. so you can still have that great dark meat flavor! forgot to mention, the boneless thighs are also skinless. Have a similar recipe I got from a friend, who actually is Polish. 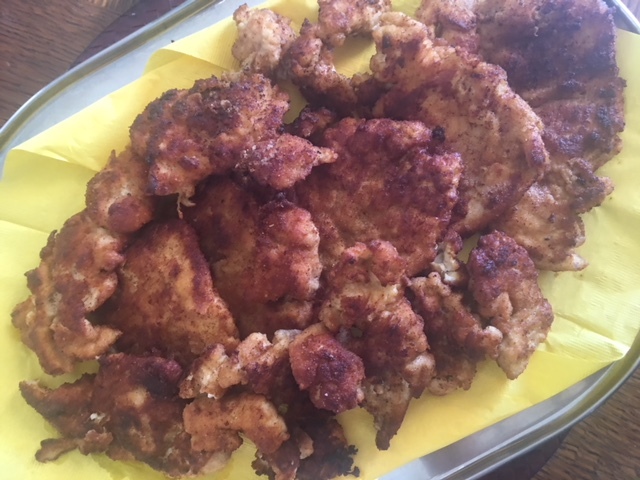 I call it “Helen’s Chicken because that is her name: tenderize the chicken breasts to 1/4 inch; bread them like you say, except put equal parts of Italian style bread crumbs & grated Parmesan cheese. Pan fry in butter; bake in hot oven 375-400 for 5-10 min.